Cosmetics containing rhododendrol (RD) were voluntarily recalled after incidents of leukoderma related to their use. Users reported using up to five different RD-containing products by layered application. In this study, we investigated the effects of layered application, formulations, and their components on the skin permeation of cosmetics containing RD. Experiments were designed to simulate actual in-use conditions, such as varying application volumes, physical mixing of formulations, sequence of cosmetics application and time interval between applications, to establish their effect on the skin permeation of RD. Milk and lotion RD-containing cosmetics (2%), 1% aqueous RD, and preparations of formulation components were applied as the first or second layers as finite doses of 10 or 20 µL/cm2. Permeation experiments were performed through excised porcine ear skin using Franz diffusion cells with an effective diffusion area of 1.77 cm2. Cosmetics applied by layered application exhibited lower skin permeation of RD compared with a single application despite having the same application dose. 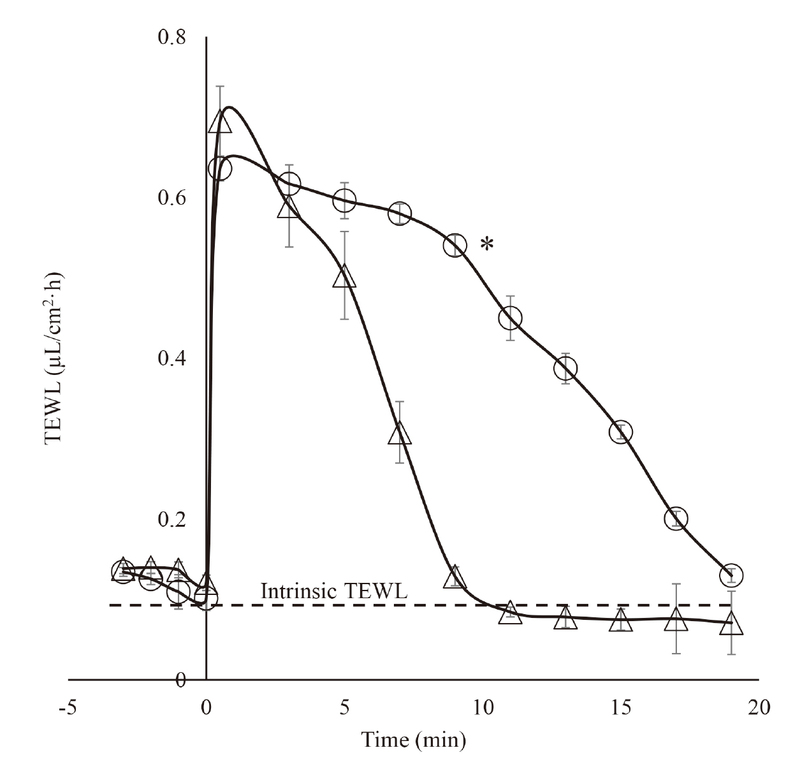 High initial volume (20 µL at 0 or 5 sec) did not exhibit any significant reduction in the permeation of RD. Formulations and their components caused varying reductions in RD permeation, probably due to changes in thermodynamic activity of the active component. Layered application, formulation components, application volume, time interval and sequence of application had significant influences on the skin permeation of the active component. Moreover, this study established a method of investigating the influence of formulations and their components on the skin permeation of actives after layered application. Cosmetics containing rhododendrol (RD) were voluntarily recalled from the market after incidents of leukoderma related to their use. Users who experienced RD-induced leukoderma reported using up to five different RD-containing products concurrently (Yamaguchi et al., 2017) suggesting a link between the incident and the applied dose of cosmetics. Habits related to cosmetics use along with the amount of cosmetics applied may have predisposed users to product-use related toxicities. Sasaki et al. (2014) reported that RD exhibits cytotoxicity against cultured human melanocytes at high concentrations. In fact, skin permeation and skin concentration of topically applied drugs and cosmetics often determine their efficacy or toxicity (Oshizaka et al., 2014). It was hypothesized that layered application of RD, that is, increasing the number of applied products on the skin, increased the skin permeation of RD, resulting in leukoderma (Sugibayashi et al., 2016). Several studies attempted to clarify the cause of leukoderma and suggested the role of tyrosinase inhibition and melanocyte cytotoxicity of RD (Arase et al., 2016; Okura et al., 2015; Aoyama et al., 2014). From a pharmaceutical point of view, these results provide very limited insights into the influence of formulations and their components, and the manner of cosmetics application (i.e., single or layered application, sequence of product application, application time interval, etc.) on the skin permeation of cosmetic active components. Layered application is described as the application of a second or succeeding dose (layer) of cosmetics on the same region after an initial application. Quasi-drug formulated as medicated cosmetics are pharmacologically or cosmetologically active, and they are commonly sold in sets to elicit their purported effects synergistically. These cosmetics are in fact recommended to be applied sequentially and in layers. Moreover, cosmetics have additional esthetic requirements of the active components and vehicles where excipients are added for reasons unrelated to dermal permeation yet may have effects on the penetration of the active components (Karadzovska et al., 2013). Our previous work revealed that RD permeation after layered application resulted in a dramatic decrease in its permeation (Sugibayashi et al., 2016). Cumulative amounts of RD permeated in infinite doses (1.0 mL/1.77 cm2) of aqueous RD was much higher than those of finite doses (10 and 20 µL/cm2) due to depletion of RD in finite dose models. Interestingly, layered application (20 µL/cm2 × 2) of RD in a lotion formulation resulted in lower permeation than a single application (40 µL/cm2) despite having the same total volume applied. The mechanistic explanation on how layered application of RD cosmetics could cause a decreased permeation profile and leukoderma remains unresolved. Although numerous studies on cosmetics safety and testing procedures have been performed (Zhang et al., 2017; Hojerová et al., 2017), the safety of practicing layered application as in most cosmetics and topical drugs has never been investigated before. Furthermore, no studies have evaluated the actual manner (layered application) in which consumers use these medicated cosmetics. Also, there are no studies clearly depicting a mechanism on how actives would permeate following layered application. Recently, actual consumption of cosmetic products reflecting Japanese cosmetics habits has been reported, prompting the need to conduct risk assessments of cosmetics products and their reported consumption dose. Also, the reported habit of using up to 5 different RD products simultaneously indicated that the amount of cosmetics consumed may be a predisposing factor for its toxicity (Yamaguchi et al., 2017). In addition, changes in skin permeation of cosmetic active components as influenced by the manner of application should be considered in the development of cosmetic formulations. In order to accurately assess the safety of chemical substances, it is important to simulate exposure as realistically as possible. Hence, in the present study, we designed experiments simulating actual in-use conditions and multiple “practices” such as varying sequences of cosmetics application, layered application, varying application volumes, and time intervals between applications to establish its effect on the skin permeation of cosmetic active components. In addition, the effects of formulations and their components on the skin permeation of cosmetic active component (RD) were also investigated. Rhododendrol (CAS no. 501-96-2; ≥ 99%) (Fig. 1 and Table 1) was provided by Kanebo Cosmetics Inc. (Tokyo, Japan). Methyl paraben, glycerin, dipropylene glycol (DPG), and sorbitol were purchased from Wako Pure Chemicals Industries, Ltd. (Osaka, Japan). 1,3 - Butylene glycol (BG) was purchased from Tokyo Chemical Industry, Co. Ltd. (Tokyo, Japan) and propylene glycol (PG) was purchased from Kanto Chemical Co. Inc. (Tokyo, Japan). Previously marketed and recalled RD products (lotion and milk, 2%) were provided by Kanebo Cosmetics Inc. (Tokyo, Japan). Table 1. Physicochemical properties of RD. 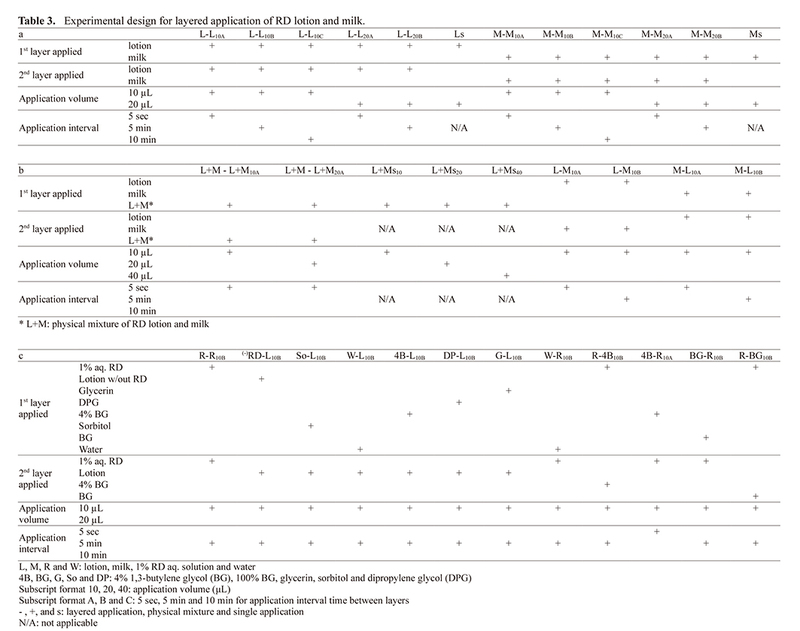 Table 2 shows the primary components of RD cosmetic formulations. Aqueous RD solution (1%) was prepared by dissolving a sufficient amount of RD in purified water to reach the desired concentration. Aqueous RD solution (1%) was prepared instead of 2% owing to its poor solubility. Lotion containing no RD was prepared using primary components, glycerin, DPG, BG, water, and sorbitol at defined proportions. A physical mixture of milk and lotion cosmetics was prepared by mixing equal amounts of milk and lotion using vortex mixer for 5 min prior to application. Table 2. Primary components of RD cosmetic formulations. * Concentration of formulation components was not indicated with the intent of Kanebo Cosmetics Inc. and Kao Corporation. Solubility of RD in each primary component (water, 5 and 10% BG solution, BG, DPG, glycerin, sorbitol, PG) was determined by adding excess amount of RD with constant stirring at 30°C for 24-48 hr. The preparation was filtered and the obtained filtrate was injected into an HPLC system to determine the concentration of RD. Frozen edible porcine ears (Central Institute for Feed and Livestock, JA Zen-Noh, Tsukuba, Ibaraki, Japan) were thawed with warm water (32°C) and rinsed with purified water. Hairs were shaved off and excess subcutaneous fats were trimmed off from the excised intact skin. Excised skin of similar thickness was derived from the same region (central dorsal) of the porcine ear. Prior to the excision of skin, visual inspection was performed to ensure intact and damage free skin was utilized. The prepared porcine ear skin was directly set on a vertical-type Franz diffusion cells with an effective diffusion area of 1.77 cm2 and the skin surface temperature was thermostatically maintained at 32°C. Hydration was done by application of 1 mL purified water to the epidermis side and 6 mL purified water was applied to dermis side (receiver compartment) to reach an equilibration state for 1 hr. Purified water on the epidermis side was removed and excess water was blotted with cotton swab. Then, RD formulation was applied with a micropipette (see Table 3). Sampling was performed by withdrawing 500 µL of receiver solution every hour for 8 hr. Samples were analyzed by high-performance liquid chromatography (HPLC). Table 3. Experimental design for layered application of RD lotion and milk. Factors such as formulations and other preparations investigated in the permeation experiments are described in this section. The sequence of application (which was applied as the first or second layer), the interval between application of the layers and application volume are also presented. The factors investigated are represented using specific study codes. As a case in point, L-L10B, refers to 10 µL of lotion applied as the first layer onto the prepared porcine ear skin followed by a second layer of 10 µL of lotion after 5 min. The first code (i.e., L, So, etc.) denotes the formulation of the first layer followed by a “-” symbol denoting layered application, then the code for the second layer applied. Applications utilizing mixtures of milk and lotion include a “+” symbol. Application volumes of 10, 20, and 40 µL are indicated by 10, 20 and 40 in subscript format, respectively. The application time interval between layers is indicated by letters - A for 5 sec, B for 5 min, and C for 10 min, also in subscript format. Non-layered or single applications include the letter “s”. Complete study codes on the factors investigated are listed in Table 3. RD preparations (2% RD lotion and milk formulations, 1% aq. RD) and formulation components were applied as finite doses. For layered application, 10 and 20 µL/cm2 volumes were used as application doses for the first and second layers of cosmetics in the experiments. Single application experiments were carried out at either 20 or 40 µL/cm2. In actual use, the application of cosmetics follows a defined sequence as to which formulation is applied first. Lotion is often recommended to be applied as a base cosmetic or first layer, whereas milk is used to a lesser extent. In the present experiment, milk and lotion formulations were applied either as the first or second layers. Table 3 summarizes the experimental design for the layered application of cosmetics. Application time interval for layered application was observed at 5 sec, 5 min, and 10 min. The intended interval time was allowed to elapse prior to the application of the second layer of cosmetics. Actual interval time of application among consumers has not been reported, hence, 5 sec, 5 min and 10 min application intervals were arbitrarily selected to reveal its effect on RD permeation. Applied formulations were spread using a spatula over the effective permeation area to ensure uniform distribution. Effect of formulation and individual components on RD permeation was also investigated using identical layered application experiments to those described above. DPG, BG, PG, sorbitol, glycerin and water were the formulation components investigated in the present study. Lotion formulation containing no RD was also prepared. Formulation components were applied as the first or second layer together with lotion or 1% aq. RD. Samples (100 µL) were added with an equal volume of internal standard (methyl paraben) and centrifuged at 4°C for 5 min. Each sample was analyzed using an HPLC system (Shimadzu Co., Kyoto, Japan) consisting of column (Inertsil® ODS-3 4.6 mm × 150 mm, GL Sciences Inc., Tokyo, Japan), system controller (SCL-10A), pump (LC-20AD), degasser (DGU-20A3), auto – injector (SIL-20A), column oven (CTO-20A), UV detector (SPD-20A), and analysis software (LC Solution). The column was maintained at 40°C with a flow rate of mobile phase (acetonitrile: water = 25:75) at 1.0 mL/min. Detection of RD was made at 280 nm. Measurement of water loss at each time-point was performed to estimate cumulative amount of water which evaporated from the applied formulation. Evaporation of water from applied formulation (10 µL/cm2) on porcine ear skin was monitored using Vapo Scan (AS-VT100RS, Asahi Techno Lab., Kanagawa, Japan) over a 20 min observation period. The TEWL measurement was performed at ambient temperature (20-25°C) and RH of 30% ± 2. Experimental data on the skin permeation of RD were tested for statistical significance (p < 0.05) using one-way ANOVA and Tukey’s HSD post hoc analysis. Water loss data were tested for statistical significance (p < 0.05) using Student’s t-Test. Figures 2a and b show the effect of interval time in layered application of either lotion or milk formulation, respectively, on the skin permeation of RD. When 40 µL of lotion in total was applied in portions (20 µL × 2, layered application) at time intervals of 5 sec and 5 min, almost the same permeation profile was observed which was approximately two-fold higher compared with a single application of 20 µL lotion (Fig. 2a). 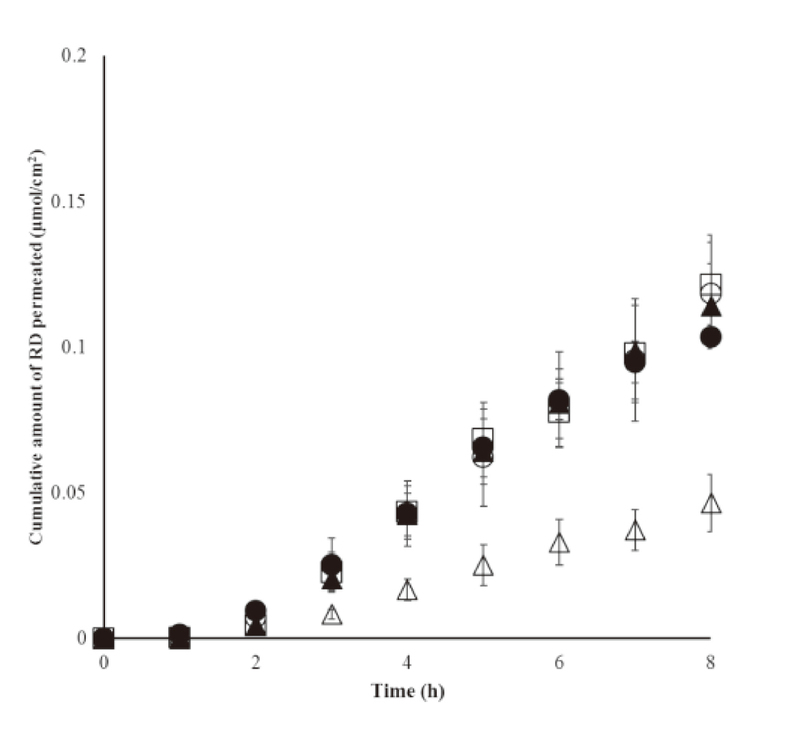 In contrast, a lower RD permeation profile was observed with the layered applications of 10 µL lotion (10 µL × 2) with increasing interval time of 5 sec, and 5 and 10 min, accordingly (Fig. 2a). With prolongation of time interval between application, a greater reduction in RD permeation was observed. A similar tendency was observed in RD permeations from milk formulations (Fig. 2b). However, the decrease in the RD permeation from milk formulations (Fig. 2b) was less than those from lotion applications (Fig. 2a). 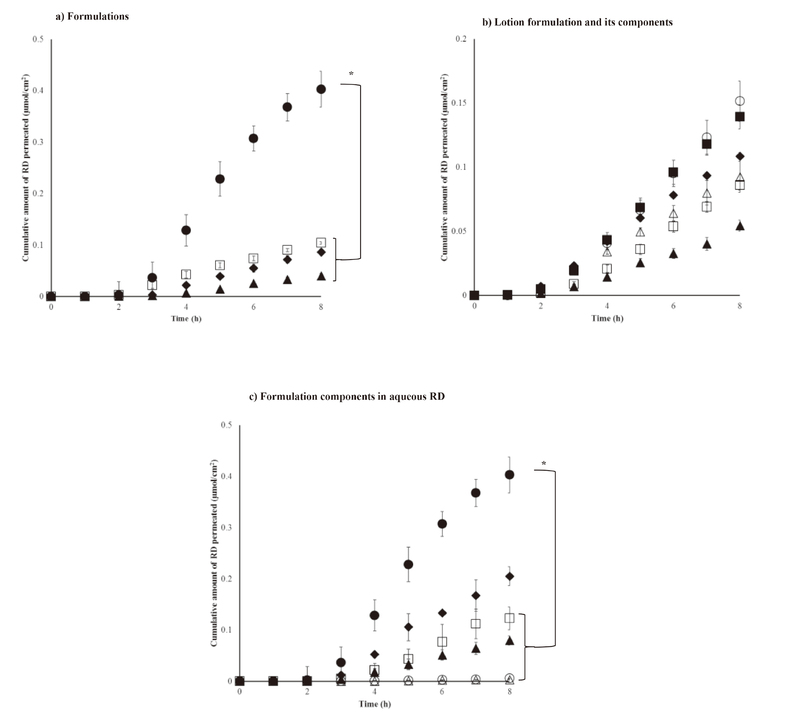 Effect of layered application, interval time and initial application volume of lotion (a) and milk (b) formulations on the skin permeation of RD. a) L-L10A (○), L-L10B (□), L-L10C (⋄), L-L20A (▲), L-L20B (Δ), Ls (●); b) M-M10A (○), M-M10B (□), M-M10C (⋄), M-M20A (▲), M-M20B (Δ), Ms (●). Each value represents the mean ± S.E. (n = 3-5). *p < 0.05. Study code L-L10A refers to layered application of 10 µL lotion with 5 sec interval time of application prior to the second application of lotion (10 µL). A, B and C represents interval time of application 5 sec, 5 min and 10 min, respectively. Complete details in Table 3 and section on experimental design for layered application. Skin permeation of RD was then evaluated from physical mixture of lotion and milk. The physical mixture corresponds to layered application with an interval time of 0 sec. Figure 3 shows the results. For the physical mixture of lotion and milk, larger volumes (> 20 µL) applied at the beginning (within 0-5 sec) did not result in a reduction in RD permeation compared with a single application of the physical mixture. Effect of initial application volume of the physical mixture of lotion and milk on the skin permeation of RD. L+M - L+M10A (○), L+M – L+M20A (▲), L+Ms10 (Δ), L+Ms20 (●), L+Ms40 (□). Each value represents the mean ± S.E. (n = 3-5). Study code L+M - L+M10A, refers to layered application of physical mixture of lotion and milk (L+M) and L+M with 5 sec interval time of application. L+Ms refers to single application of physical mixture of lotion and milk. Complete details in Table 3 and section on experimental design for layered application. Figure 4 shows the skin permeation of RD after application of lotion or milk as the first layer prior to the addition of the second layer of milk or lotion, respectively. A physical mixture containing equal amounts of lotion and milk was applied as the first layer and served as the basis for comparison. The skin permeation of RD after the application of lotion as the first layer and milk as the second layer and vice versa, with a 5 sec interval time exhibited a lower skin permeation compared with the physical mixture. A similar pattern was noticed wherein longer time interval between applications resulted in lower RD permeation in experiments using lotion as the first layer and milk as second layer, and vice versa. Milk applied as first layer exhibited lower permeation as compared with lotion being applied as the first layer. Effect of sequence of application (lotion to milk and milk to lotion) on the skin permeation of RD. L-M10A (○), L-M10B (□), M-L10A (▲), M-L10B (■), L+Ms20 (●). Each value represents the mean ± S.E. (n = 3-5). Study code L-M10A refers to layered application of lotion as first layer and milk as second layer with 5 sec interval time of application. Complete details in Table 3 and section on experimental design for layered application. Figure 5a shows the effect of formulation on the skin permeation of RD when applied in layers. Layered application of aqueous solution containing 1% RD exhibited a 3.4-fold higher permeation compared with its formulated counterparts containing 2% RD, even at a half concentration of RD. It was noticeable that the skin permeation of RD from milk and lotion formulations was significantly lower. This indicated that the type of formulation markedly affected the skin permeation of RD. Effect of formulations and formulation components on the skin permeation of RD. a) R-R10B (●), L-L10B (■), M-M10B (♦), (-)RD-L10B (▲); b) So-L10B (○), W-L10B (■), 4B-L10B (♦), DP-L10B (Δ), G-L10B (□), (-)RD-L10B (▲); c) R-R10B (●), W-R10B (♦), R-4B10B (□), 4B-R10A (▲), BG-R10B (Δ), R-BG10B (○). Each value represents the mean ± S.E. (n = 3-5). *p < 0.05. Study code So-L10B refers to layered application of sorbitol as first layer and lotion as second layer with 5 sec interval time of application. 4B, BG, G, and DP refers to 4% 1,3-butylene glycol (BG), 100% BG, glycerin, and dipropylene glycol (DPG), respectively. Complete details in Table 3 and section on experimental design for layered application. Both the lotion and milk formulations used in the present study contained glycerin, DPG, BG, water and sorbitol as the primary formulation components (Table 2). Thus, the effect on the skin permeation of RD by pretreatment with these primary components when applied as the first layer was evaluated. Figure 5b shows the effect of pretreatment with primary components applied as the first layer on RD permeation. Formulation of lotion without RD (containing primary components only) was applied as the first layer and followed by application of lotion with 5 min interval resulted to the greatest reduction in the skin permeation of RD. Higher RD permeations were observed when sorbitol and water were applied as the first layers. On the other hand, decreased RD permeation was observed when BG, DPG and glycerin were applied as the first layers compared with sorbitol and water. Figure 5c shows the skin permeation of RD for the two cases of treatment. An aqueous solution of RD was applied as the first layer followed by application of the same aqueous RD solution, 4% BG or BG for the first case. Aqueous RD solution, water or BG solution was applied as the first layer and followed by application of aqueous RD solution at an interval of 5 min, for the second case. The second layer applied, 4% BG or BG markedly decreased RD permeation in contrast with the second application of aqueous RD solution. Of note, low to no skin permeation of RD was observed with the application of BG as first and second layer. Figure 6 presents the changes in water loss values after application of lotion or milk. The method directly measured water loss from each time-points as well as detecting total water loss from applied formulations. The application of lotion and milk as the first layer had TEWL values of 60 g/m2/hr and 55 g/m2/hr, respectively, at 0.5 min. Water loss at 0-10 min was significantly higher when compared with those prior to application and 10 min onwards for both formulations. The rate of TEWL for applied lotion was significantly faster than milk. A similar controlled monitoring of evaporation was performed by 10 µL water on stacks (4 layers) of filter paper stabilized on a petri dish and was thermostatically maintained at 32°C. Cumulative amount of water evaporated after 30 min practically reflects the initial volume applied. Notably, TEWL values for both porcine ear skin and filter paper (data not shown) decreased over time with water loss highest at 0-10 min. Changes in percent TEWL. TEWL of single application (10 µL/cm2) of milk (○) and lotion (Δ). Each value represents the mean ± S.E. (n = 3-5). Significant difference (*p < 0.05) between water loss for milk and lotion at 10 min. Table 4 shows the saturated solubility of RD in primary components of the lotion and milk formulations. Consistently, RD had higher solubility with BG along with DPG, and lower solubility with water. Table 4. Solubility of RD with primary components. In the present study, we focused on understanding how cosmetic active components, when applied onto the skin as finite dose would permeate the skin in a similar manner in daily practice, that is applying it in layers of various formulations. Layered application of cosmetics was previously established to reduce the skin permeation of RD, but the mechanism of how “layers” influence the permeation of active components remain poorly understood. Evaluation of dermal absorption of cosmetic products using skin from mammalian species including humans have long been established; however, due to obvious constraints in availability and ethical concerns associated with the use of human skin, alternatives are widely sought (OECD, 2004a). Edible porcine skin is regarded as being physiologically and morphologically similar (Flaten et al., 2015; Todo, 2017) and is recognized by dermatological scientists to possessing good correlation coefficient (r = 0.88), for the permeation of a great number of chemicals, to human skin (Barbero and Frasch, 2009; OECD, 2004b; Hojerová et al., 2017). Also, the assessment of dermal absorption of cosmetics is ascribed to be performed on porcine skin (SCCS, 2010; OECD, 2011). Hence, edible porcine skin was used to evaluate the effect of cosmetics layered application on the skin permeation of RD. The results in the present study implicated several mechanisms that can influence the permeation of an active component. Since the application volume of 10 µL/cm2 was sufficient to uniformly cover the effective skin permeation area, the application volumes of 10 and 20 µL/cm2 were used to elucidate the effect of layered application on the skin permeation of RD. 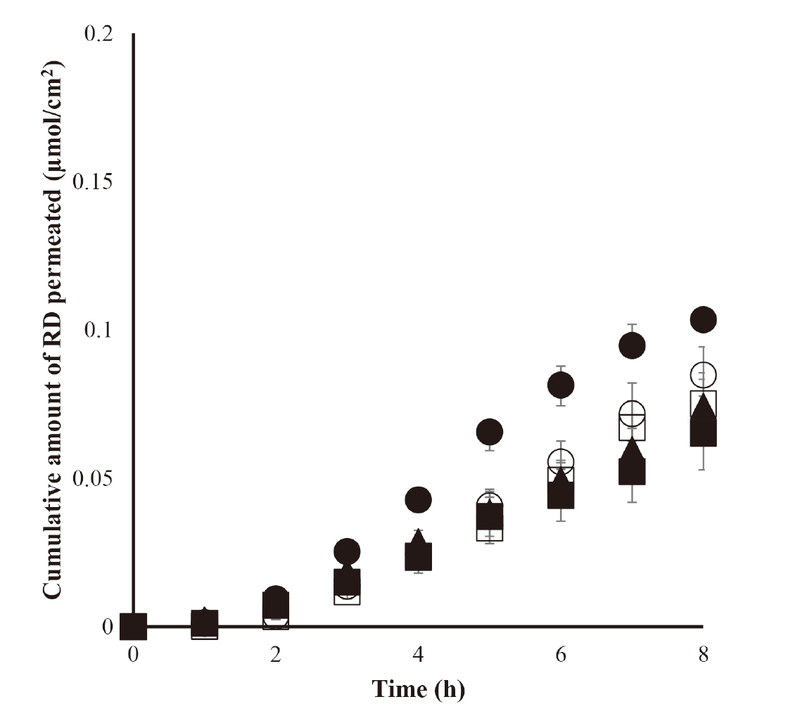 Of note, the application of lotion as the first layer with a longer interval time between applications, 5 and 10 min, exhibited a significant reduction in RD permeation (Fig. 2a). Moreover, short application intervals (5 sec) of cosmetics yielded similar results as for permeation after a single application (Fig. 2a, b). On the other hand, evidence suggested that large volumes (20 µL) of cosmetics applied at the beginning of the permeation experiment resulted in the higher permeation of the active components (Fig. 2a, b). When layered application was performed with different formulations, changes in the composition of the first and second layer occurred upon mixing at the application site. Physical mixing or addition of other components to formulations comprising oil-in-water or water-in-oil emulsion might cause instability. Even when the same formulation is applied, the composition of the first layer becomes non-identical with the second layer due to the evaporation of solvents (Fig. 3). In general, elevated skin temperature enhances drug permeation primarily related to increased diffusivity attributed to the increase in the fluidity of stratum corneum lipids leading to increase (expansion) in intercellular space (Akomeah et al., 2004; Hao et al., 2016). However, the effect of temperature on evaporation and permeation of actives in layered application is not clearly understood. Water loss data revealed that water evaporation occurred immediately after application of the cosmetics regardless of the type of formulation. High evaporation rates take place within 0-10 min (Fig. 6) suggesting rapid supersaturation of the applied layer and effectively reduced permeation of active component possibly due to crystallization (Coldman et al., 1969; Santos et al., 2010). Although polyols such as DPG, BG and glycerin in the formulation are known chemical enhancers for topically applied drugs by increasing their partition coefficient from the formulation into the stratum corneum, permeation of RD after layered application of 10 µL/cm2 exhibited lower permeation compared with a single application despite having the same application volume (Fig. 4). Moreover, an increase in the concentration of non-volatile components such as DPG, BG and glycerin occurs in the residual phase after the high evaporation rate of water at the time of application. The influence of formulation components on the skin permeation of the active component was confirmed in terms of its effects on solubility and consequential RD permeability. BG (4%) and BG (100%) applied as the first layers resulted to a reduction in RD permeation by 1.6-fold and 80-folds, respectively (Fig. 5). Saturated solubility of RD in BG, DPG and glycerin was much higher compared with water (Table 4). A two-fold increase in RD solubility in water in the presence of 5-10% BG and a 58-fold increase with 100% BG was observed. An increase in concentration of polyols is presupposed to promote the solubility of the permeating RD in the residual phase, thereby reducing its thermodynamic activity and consequently the skin permeation of RD. This concept was emphasized by Lane and colleagues (2010) describing the importance of high amount of solvent (i.e., water) in the residual phase that should remain on the skin in order to maintain the thermodynamic activity as high as possible to aid in the permeation of the active component. Similarly, the significantly higher solvent evaporation from the lotion could result in an increase in the concentration of RD and/or produce a supersaturated state in formulation which is a possible mechanism of its increased permeation after a single application and large application volumes (20 µL/cm2) (Oliveira et al., 2012). Differences in the skin permeation of model compounds in previous studies were attributed to changes in drug solubility/ thermodynamic activity in the residual phase induced by the evaporation of solvents (i.e., water) from the formulation (Oliveira et al., 2012; Tanaka et al., 1985). The sequence of application affects the skin permeation wherein milk applied as the first layer resulted in decreased skin permeation of RD (Fig. 4). Lotion, on the other hand, having more water content than milk, produced a less viscous mixture (lower viscosity) rendering RD with a better diffusion environment and subsequently higher permeation extent (Wang et al., 2006). Rheological and mechanical properties of formulation are known to affect penetration of actives wherein increase in viscosity results in a reduction in permeation (Gu et al., 2005; Ross and Shah, 2000; Karakatsani et al., 2010). With a lotion formulation containing no RD applied it as the first layer, it was found that components of lotion formulation altogether resulted in a 2.6-fold decrease in RD permeation (Fig. 5). Furthermore, formulation components were prepared reflective of their respective concentrations in the formulation and applied as the first layers. Formulation components, 4% BG, DPG, and glycerin resulted in 1.3-, 1.5-, and 1.6- fold decrease in RD permeation, respectively (Fig. 5a). In addition, milk formulation contains an exclusive component, PG. PG was previously reported to rapidly permeate, thereby promoting crystallization of the active components further supporting the lower permeation of RD in milk as opposed to lotion (Hadgraft and Lane, 2016). Our findings indicate that to minimize undesired permeation profiles of RD after layered application, lotion should be applied as the first layer with a short interval (< 1 min) with respect to its second layer. In addition, it is desirable to have a large initial volume to be applied rather than distantly spaced and applied in divided doses. The design of the formulations should be reviewed with respect to the active component’s solubility and its consequential thermodynamic activity. As calculated from the 90th percentile of respondents, the amount of lotion used per application, 1.62 g (Yamaguchi et al., 2017) and total facial skin area, 565 cm2 (SCCS/1416/11, 2012) suggested that approximately 2.8 µL/cm2 of lotion is the practical amount used per application. Water evaporation rate constant (kevap) was reported to be 2340 × 10-10 ms-1 (Gadjjar et al., 2013). This would theoretically mean that about 70% of the water in a topically applied formulation at 10 µL/cm2 would evaporate in 5 min, and about 65% of the water from an applied formulation at 20 µL/cm2 would remain. Thus, in the case of application with doses lower than 10 µL/cm2, layered application would induce reduction in the skin permeation of RD. The need for ensuring safety of cosmetic products was recently raised by a group of cosmetic scientists as a large population of women utilize these products on a daily basis over an extended period of time (Yamaguchi et al., 2017). We have established, for the first time, that layered application and components of a formulation can be investigated with regard to their influence on the skin permeation of actives thus, assessing safety of cosmetics used concurrently or in layers. The authors appreciate Kanebo Cosmetics Inc. and Kao Corporation for supplying cosmetics used in this experiment. Also, we thank them for disclosing the ingredients/ primary components of the cosmetics studied. Akomeah, F., Nazir, T., Martin, G.P. and Brown, M.B. (2004): Effect of heat on the percutaneous absorption and skin retention of three model penetrants. Eur. J. Pharm. Sci., 21, 337-345. Aoyama, Y., Ito, A., Suzuki, K., Suzuki, T., Tanemura, A., Nishigori, C., Ito, M., Katayama, I., Sugiura, S. and Matsunaga, K. (2014): The first epidemiological report of rhododenol-induced leukoderma in Japan based on a nationwide survey. Jpn. J. Dermatol., 124, 2095-2109. Arase, N., Yang, L., Tanemura, A., Yang, F., Suenaga, T., Arase, H. and Katayama, I. (2016): The effect of rhododendrol inhibition of NF-κB on melanocytes in the presence of tyrosinase. J. Dermatol. Sci., 83, 157-159. Barbero, A.M. and Frasch, H.F. (2009): Pig and guinea pig skin as surrogates for human in vitro penetration studies: a quantitative review. Toxicol. In Vitro, 23, 1-13. Coldman, M.F., Poulsen, B.J. and Higuchi, T. (1969): Enhancement of percutaneous absorption by the use of volatile: nonvolatile systems as vehicles. J. Pharm. Sci., 58, 1098-1102. Flaten, G.E., Palac, Z., Engesland, A., Filipović-Grčić, J., Vanić, Ž. and Škalko-Basnet, N. (2015): In vitro skin models as a tool in optimization of drug formulation. Eur. J. Pharm. Sci., 75, 10-24. Gajjar, R.M., Miller, M.A. and Kasting, G.B. (2013): Evaporation of volatile organic compounds from human skin in vitro. Ann. Occup. Hyg., 57, 853-865. Gu, X., Wang, T., Collins, D.M., Kasichayanula, S. and Burczynski, F.J. (2005): In vitro evaluation of concurrent use of commercially available insect repellent and sunscreen preparations. Br. J. Dermatol., 152, 1263-1267. Hadgraft, J. and Lane, M.E. (2016): Advanced topical formulations (ATF). Int. J. Pharm., 514, 52-57. Hao, J., Ghosh, P., Li, S.K., Newman, B., Kasting, G.B. and Raney, S.G. (2016): Heat effects on drug delivery across human skin. Expert Opin. Drug Deliv., 13, 755-768. Hojerová, J., Peráčková, Z. and Beránková, M. (2017): Margin of safety for two UV filters estimated by in vitro permeation studies mimicking consumer habits: effects of skin shaving and sunscreen reapplication. Food Chem. Toxicol., 103, 66-78. Karadzovska, D., Brooks, J.D., Monteiro-Riviere, N.A. and Riviere, J.E. (2013): Predicting skin permeability from complex vehicles. Adv. Drug Deliv. Rev., 65, 265-277. Karakatsani, M., Dedhiya, M. and Plakogiannis, F.M. (2010): The effect of permeation enhancers on the viscosity and the release profile of transdermal hydroxypropyl methylcellulose gel formulations containing diltiazem HCl. Drug Dev. Ind. Pharm., 36, 1195-1206. Lane, M.E., Hadgraft, J., Oliveira, G., Vieira, R., Mohammed, D. and Hirata, K. (2012): Rational formulation design. Int. J. Cosmet. Sci., 34, 496-501. OECD. (2004a): Organization for Economic Cooperation and Development. Guideline 428: Skin Absorption. OECD Press. P 8. OECD. (2004b): Organization for Economic Cooperation and Development. Guidance document for the conduct of skin absorption studies number 28. OECD Press, P 14. OECD. (2011): Organization for Economic Cooperation and Development. Guidance Notes on Dermal Absorption. Series on Testing and Assessment number 156. OECD Press. P 26. Okura, M., Yamashita, T., Ishii-Osai, Y., Yoshikawa, M., Sumikawa, Y., Wakamatsu, K. and Ito, S. (2015): Effects of rhododendrol and its metabolic products on melanocytic cell growth. J. Dermatol. Sci., 80, 142-149. Oliveira, G., Hadgraft, J. and Lane, M.E. (2012): The influence of volatile solvents on transport across model membranes and human skin. Int. J. Pharm., 435, 38-49. Oshizaka, T., Kikuchi, K., Kadhum, W.R., Todo, H., Hatanaka, T., Wierzba, K. and Sugibayashi, K. (2014): Estimation of skin concentrations of topically applied lidocaine at each depth profile. Int. J. Pharm., 475, 292-297. Ross, J.S. and Shah, J.C. (2000): Reduction in skin permeation of N,N-diethyl-m-toluamide (DEET) by altering the skin/vehicle partition coefficient. J. Control. Release, 67, 211-221. Santos, P., Watkinson, A.C., Hadgraft, J. and Lane, M.E. (2010): Oxybutynin permeation in skin: the influence of drug and solvent activity. Int. J. Pharm., 384, 67-72. Sasaki, M., Kondo, M., Sato, K., Umeda, M., Kawabata, K., Takahashi, Y., Suzuki, T., Matsunaga, K. and Inoue, S. (2014): Rhododendrol, a depigmentation-inducing phenolic compound, exerts melanocyte cytotoxicity via a tyrosinase-dependent mechanism. Pigment Cell Melanoma Res., 27, 754-763. SCCS/1416/11: (2012): The SCCS’s Notes of Guidance for the testing of cosmetic ingredients and their safety evaluation, 7th revision. Scientific Committee on Consumer Safety. P 68. SCCS/1358/10: (2010): Basic criteria for the in vitro assessment of dermal absorption of cosmetic ingredients. Scientific Committee on Consumer Safety. P 8. Sugibayashi, K., Todo, H. and Oda, A. (2016): Effect of layered application of different cosmeceutical formulations containing rhododendrol. J. Jpn. Cosmet. Sci. Soc., 40, 259-261. Tanaka, S., Takashima, Y., Murayama, H. and Tsuchiya, S. (1985): Studies on drug release from ointments. V. Release of hydrocortisone butyrate propionate from topical dosage forms to silicone rubber. Int. J. Pharm., 27, 29-38. Todo, H. (2017): Transdermal Permeation of Drugs in Various Animal Species. Pharmaceutics, 9, 33. Yamaguchi, M., Araki, D., Kanamori, T., Okiyama, Y., Seto, H., Uda, M., Usami, M., Yamamoto, Y., Masunaga, T. and Sasa, H. (2017): Actual consumption amount of personal care products reflecting Japanese cosmetic habits. J. Toxicol. Sci., 42, 797-814. Wang, T., Kasichayanula, S. and Gu, X. (2006): In vitro permeation of repellent DEET and sunscreen oxybenzone across three artificial membranes. Int. J. Pharm., 310, 110-117. Zhang, X., Yu, Y., Gu, Y., Li, X., Zhang, X. and Yu, Y. (2017): In vitro determination of transdermal permeation of synthetic musks and estimated dermal uptake through usage of personal care products. Chemosphere, 173, 417-424.